Out with the mower, in with the blower. That’s today’s message as we get closer to winter. If you have not done so already, it’s time to get your lawn mower ready for winter storage. You want to take the time to properly winterize your mower now so that it works properly when you are ready to rev it up again in the spring. You may think winterizing your mower means parking it in the shed (if you have a shed) until baseball season rolls around again. You’ll want to do a little more than that. Pick up some gasoline stabilizer. It won’t cost much but it will pay off for your mower. Gas that sits in a mower’s tank all winter long can clog the carburetor. The ensuing repair job will cost a lot more than that fuel stabilizer. For every two-and-a-half gallons of gas in the tank, add one gallon of an ethanol-capable gas stabilizer. Change the oil. This will help extend the life of the mower’s engine. If you have a riding mower, try and charge the battery periodically during the winter months. Start the mower and let it run for several minutes. Consider scraping the grass clippings from the underside of the mower deck after the final mow of the season. This will help prevent rust. Make sure to store your mower in a clean, dry place. 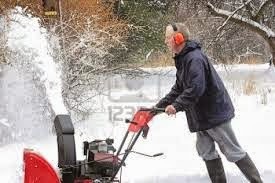 Once your mower is ready for winter, it’s time to think about getting your snow blower ready for action. Make sure you've changed the oil at least once during the last year. It’s a good idea to start the snow blower season with fresh oil and gasoline. If you have questions about your snow blower’s specific engine-type, check the owner’s manual. Check to see if any nuts or bolts need to be tightened. The vibration of the snow blower can cause nuts and bolts to loosen, especially on the control linkage. Check the belts on your blower to make sure there is no cracking or fraying. Make sure the augers and runners are correctly adjusted and in good shape. Check the air in the tires. Tires can get soft or flat over the summer. If you have any questions or concerns, check with local snow blower repair shop. This is the time of year where some snow blower dealers will run tune-up specials for the winter ahead.